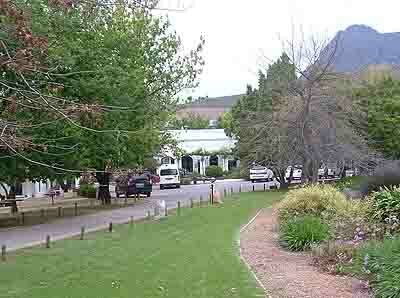 Visiting the wine farms in the Stellenbosch area has become an important pastime for visitors to Cape Town. Each day tour buses and coaches descend on Stellenbosch bringing their loads of international visitors to savour the wines of the Cape. A short cellar tour and a quick wine tasting is what most visitors get before being whisked off to another farm for another wine tasting. What visitors don't realise is the history of some of the farms that they visit. For this article I have selected two farms which I have had the pleasure of visiting recently. They are the Backsberg and the Fairview Estates . The story begins way back in 1916 when a penniless political and religious refugee arrived in Cape Town from Lithuania. Starting work as a dockhand on the reclamation of land for what is today called the V & A Waterfront Mr Charles L Back moved on to be a delivery boy peddling his bicycle around Cape Town. Eventually he found his way to Paarl where he purchased a butcher shop on the Paarl railway station and sold meat and farm produce from the shop. Watching the farmers of the Paarl area grow wine Charles Back soon developed and interest in wine. Then, one day someone entered his shop and offered to sell him a wine farm. Back jumped at the offer and was soon the owner of Klein Babylonstoren a farm on the Paarl-facing slopes of the Simonsberg mountain range. The name of the farm he eventually changed to the Backsberg Estate Cellars. At the time of the purchase mixed farming was the order of the day with wine taking a back seat. Slowly during the 1920's grapes were introduced and the farm began producing wine. Most of the wines were sold directly to the KWV, a wine makers co-operative in the Paarl region. Back liked being independent and also sold some of his wines directly to destinations in the UK and France where there was a shortage after the second world war. In 1926 Charles Back produced a championship wine which enabled him to develop a flourishing export market for his wines. With the growing export market he needed another farm and when he came across the farm Bloemkoolfontein situated on the slopes of the Paarl mountain in 1937 he bought it. Bloemkoolfontein was originally demarcated as a farm in 1693 when the land was granted to a Steven Verwey who is thought to have been one of the French Huguenots who settled in the area at the request of Simon van der Stel. Soon after purchasing the farm Charles Back changed its name to Fairview. Charles and his wife had two sons, Sydney and Cyril Back. Both sons eventually joined their father on the farm where they learnt the art of farming as well as wine making. Upon his death in 1955 Charles Back left his farms to his sons, the Backsberg Estate going to Sydney and the Fairview Estate to Cyril. On taking over the Backsberg Estate Sydney focused his attention on wine farming and over the next ten years planted vines where in the past he had had orchards. Soon he was producing large volumes of low priced wines. The bigger farms did not enjoy his successes and started to squeeze him out of the market. Eventually in 1969 Sydney received an offer from someone wanting to purchase the brand name �Backs Wines� and he agreed to sell the name together with the stock, the plant and all the equipment belonging to Back's Wines. It turned out to be a decision that he would never regret as it gave him the chance to start over again. In the meantime his brother Cyril who had inherited the Fairview farm started replanting his vineyards. The Cinsaut grapes were pulled up and classic cabernet sauvignon and shiraz, as well as pinotage grapes were planted in their place. A while later pinot noir and chenin blanc grapes were also planted. With all the changes the Fairview farm soon became a leading supplier of wine to the KWV. The entrepreneurial brothers loved a challenge and in 1970 Sydney became one of the first wine farmers in the Cape to sell wine direct to the public. In 1974 Cyril followed in his brothers footsteps when he bottled his own wines and arranged an auction where he sold 1500 cases of Fairview wines to the public. This ruffled the feathers of the wine wholesalers of the Cape who now had to find new ways of marketing their wines. Since then many changes have occurred on the farms. Both the Backsberg and the Fairview estates have been passed on to a younger generation as both Sydney and Cyril Back have passed away. The new owner of the Backsberg Estate, Michael Back, has made some major changes to the farm since taking control. The piggery and meat processing business on the farm has been sold and all under-performing vineyards have been ripped out and replaced. The idea of cheap wines has been forgotten and the farm is now concentrating on making quality wines. To see how successful they have been all one has to do is visit the farm and taste some of the fine wines and brandies on offer. Changes made by the younger generation on the Fairview Estate have also met with great success. The original homestead built in 1722 which was sold off when the farm was subdivided years ago has been repurchased and restored. A chestnut grove growing behind the homestead which once supplied nuts to the markets of Cape Town has been nurtured back to health. The herd of dairy goats left by Cyril Back has been put to good use. A cheesery producing international award winning cheeses has been established using the milk produced by the goats. The farm now produces four ranges of wines one of which has a label called Goats do Roam. In addition to all the above a Meditteranean-style indoor al fresco eatery has also been established. Visitors can now savour wines from the farm while enjoying a meal at the eatery. 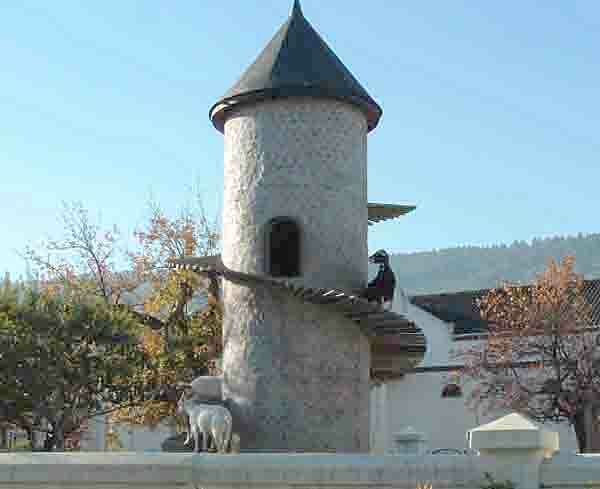 Today both farms form part of the Stellenbosch/Paarl wine route and can be visited privately or on scheduled tours. Why not visit Cape Town now and enjoy the winelands.